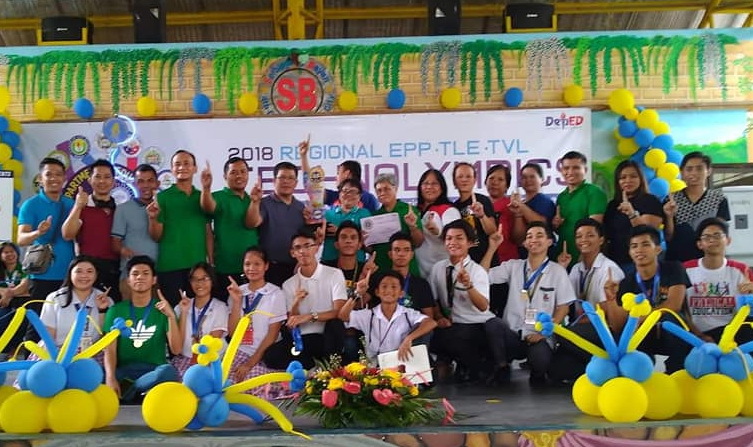 By dominating 9 of 11 technology competitions, Taguig City catapulted the Department of Education’s Division of Taguig and Pateros to overall champion at the 2018 Regional Technolympics and Skills Competition (RTSC) held on November 28-29 at Esteban Abada Elementary School in Quezon City. The RTSC is an annual event initiated by the DepEd to showcase the talents of students taking up Edukasyong Pantahanan at Pangkabuhayan (EPP), Technology and Livelihood Education (TLE), and Technical-Vocational-Livelihood (TVL). Among the winning students was Grade 12 student Ricardo Aludo from Western Bicutan National High School (WBNHS), who emerged victorious in the Computer Systems Servicing (CSS) category. Under the Information and Communication Technology (ICT) component area, the CSS event allowed a single participant to demonstrate knowledge and skill in installing and configuring computer systems and setting up computer network and server within four (4) hours. The time limit posed no problem for the participant who is competing for the fourth time since he would usually finish the task in only 1-2 hours. But he also admitted being anxious during the competition. Aludo began joining the competition when he was in Grade 9, and previously failed to place well. But with persistence and the help of his trainer Rolando M. Iglesia, he continued to join and finally took the top plum in the regionals this year. Aludo would train to four times a week. “Gusto ko po kasi na ma-enhance yung skills ko kaya po ako patuloy na sumasali. At saka ito po talaga yung hilig ko at yung gusto ko pong maging sa future ko,” the student explained. Agudo, while being a full-time student, already earns money as a part-time repair technician. Students from Signal Village National High School (SVNHS) — Abraham Canoy, Wendy Claire Anilao, Christ John Del Valle, Ylyzza Naomie Miana, Kyle Sandie Baraquiel, Gio Mabanan and Jhon Neumann Oregon — secured first runner up poitions in the categories Dressmaking, Bread and Pastry Production, and Food Processing. Taguig Science High School’s Arthur Betez Jr. took first runner-up in Technical Drafting (CAD) category. Ramil Manago, Michael Jay Sablada and Renzly Magsipoc — also from SVNHS — won second and third runners-up, respectively, in the Furniture and Cabinet Making, and Electrical Installation and Maintenance categories. In the elementary level, Upper Bicutan Elementary School’s Elisha Kharyl Awingan and Cynthia Leanne Lequillo, and Taguig Integrated School’s Kendrix Dave Lineallo and Allen Lorenz dela Masa were all fourth runners-up in the Dish Gardening and Silk Preparation and T-shirt Printing categories. All regional winners are set to compete in the 2019 National Technolympics and Skills Competition which will be held on January 28 to February 1 in Dagupan, Pangasinan. “We would like to thank the Mayor for her continued support. We hope that she continues to touch the lives of our children and to serve as an inspiration so that we can develop more leaders the way she set herself as an example for our youth,” Office of the School Governance and Operations Chief Education Supervisor Dr. George P. Tizon said. The probinsiyudad considers the sweep as a product of its unyielding support for Taguigeño students. Taguig students enjoy the use of “Cyberlabs,” air-conditioned facilities complete with computers and a projector. Through the Computer Assisted Learning (CAL) program, Taguigeño students can choose to take courses in Web page design, personal computer operations, hardware troubleshooting, computer programming, digital arts, animation, Photoshop, graphics design, Web programming and digital movie-making. In the bigger education agenda, all students from the 36 public schools in the city receive free school supplies, uniforms, hygiene kits, shoes, bags, emergency grab bags, as well as raincoats, before the start of each school year. Once they graduate from the secondary level, they are encouraged to further their studies with the city’s Lifeline Assistance for Neighbors In-need (LANI), a scholarship program designed to cater to all Taguigeño youth. Last July 2017, the city government of Taguig increased the allowances of city scholars, now ranging from P15,000 to P60,000, depending on what type of scholarship the student has availed. Matapos bumida sa siyam ng kabuuang labing-isang technology competitions, inangat ng Taguig City ang Division of Taguig and Pateros ng Department of Education (DepEd) para makamit ang overall champion sa 2018 Regional Technolympics and Skills Competition (RTSC) na ginanap nitong November 28-29 sa Esteban Abada Elementary School sa Quezon City. Ang RTSC ay taunang patimpalak na pinapangasiwaan ng DepEd upang maipakita ang mga talento ng mga estudyante na kumukuha ng kursong Edukasyong Pantahanan at Pangkabuhayan (EPP), Technology and Livelihood Education (TLE), and Technical-Vocational-Livelihood (TVL). Kasama sa mga nagwagi na mga Grade 12 student ay si Ricardo Aludo mula sa Western Bicutan National High School (WBNHS), na naipanalo ang Computer Systems Servicing (CSS) category. Sa ilalim ng Information and Communication Technology (ICT) component area, ang CSS event ay pinapayagan ang single participant upang maipakita ang angking talino at kakayanan sa pag-install at pag-configure ng ng computer systems pati na rin ang pag-set up ng computer network at server sa ilalim lamang ng apat na oras. Ang time limit na itinakda sa mga kalahok ay hindi naging problema kay Aludo dahil pang-apat na beses na siyang lumaban rito at kadalasan ay natatapos niya ang proseso ng mga isa hanggang dalawang oras lamang. Subalit inamin din niya na medyo kabado siya habang lumalaban sa kumpetisyon. Nagsimulang sumali si Aludo sa mga patimpalak noong siya ay nasa Grade 9 pa lamang, at noon ay madalas pa siyang hindi makapasok sa winning circle. Naging insipirasyon niya ito upang magpursige pa ng husto at sa tulong ng kanyang trainer na si Rolando M. Iglesia ay umangat siya sa top spot sa regionals ngayong taon. Ang training ni Aludo ay umaabot sa halos apat na beses sa loob ng isang linggo. “Gusto ko po kasi na ma-enhance yung skills ko kaya po ako patuloy na sumasali. At saka ito po talaga yung hilig ko at yung gusto ko pong maging sa future ko,” paliwanag pa ni Aludo. Si Aludo, sa kabila ng pagiging full-time sa estudyante, ay kumikita na rin ng pera bilang part-time repair technician. Ang mga estudyante naman mula sa Signal Village National High School (SVNHS) — na sina Abraham Canoy, Wendy Claire Anilao, Christ John Del Valle, Ylyzza Naomie Miana, Kyle Sandie Baraquiel, Gio Mabanan at Jhon Neumann Oregon — ay nasungkit ang first runner upsa kategorya ng Dressmaking, Bread and Pastry Production, at Food Processing. Ang estudyante naman mula sa Taguig Science High School na si Arthur Betez Jr. ay inuwi ang first runner-up na titulo sa Technical Drafting (CAD) category. Sina Ramil Manago, Michael Jay Sablada at Renzly Magsipoc — pawang mga galing din sa SVNHS — ay nag-uwi naman ng second at third runner-up, respectively, sa Furniture and Cabinet Making, at Electrical Installation and Maintenance categories. Sa level naman ng elementarya, ang mga estudyante mula sa Upper Bicutan Elementary School na si Elisha Kharyl Awingan at Cynthia Leanne Lequillo, at ng Taguig Integrated School students na sina Kendrix Dave Lineallo at Allen Lorenz dela Masa ay nauwi ang fourth runner-up sa Dish Gardening and Silk Preparation at sa T-shirt Printing categories. Ang lahat ng regional winners ay nakatakdang lumaban sa 2019 National Technolympics at Skills Competition kung saan ay gaganapin ito sa January 28 hanggang February 1 sa Dagupan, Pangasinan. “We would like to thank the Mayor for her continued support. We hope that she continues to touch the lives of our children and to serve as an inspiration so that we can develop more leaders the way she set herself as an example for our youth,” wika ni Office of the School Governance and Operations Chief Education Supervisor Dr. George P. Tizon. Ang tinaguriang probinsiyudad ng Metro Manila ay pumasok sa winning top circle dahil na rin sa walang sawang suporta ng pamahalaang lokal para sa mga estudyante ng Taguig. Kasama sa ipinatupad na pagbabago sa lungsod ay ang maginhawang silid aralan ng mga Taguig students kasama na rito ang pag-gamit nila ng “Cyberlabs,” air-conditioned facilities na kumpleto ng computer setup at projector. Sa ilalim ng Computer Assisted Learning (CAL) program, ang mga Taguigeñong estudyante ay maluwag na makakakuha ng kursong Web page design, personal computer operations, hardware troubleshooting, computer programming, digital arts, animation, Photoshop, graphics design, Web programming at ang digital movie-making. Sa mas malawak na programang pang-edukasyon ng Taguig, ang mga estudyante mula sa 36 public schools sa lungsod ay nakakakuha ng libreng school supplies, uniforms, hygiene kits, shoes, bags, emergency grab bags, pati na rin ang mga kapote bago pa man magsimula ang klase taun-taon. Sa kanilang pagtatapos naman sa secondary level, hinihikayat din sila na ipagpatuloy pa ang kanilang pag-aaral sa ilalim ng Lifeline Assistance for Neighbors In-need (LANI), isang scholarship program na dinisenyo sa lahat ng Taguigeño youth. Noon lamang July 2017, ang city government ng Taguig ay nagtaas ng nakukuhang allowance ng mga city scholar, at ngayon ay umaabot na ito mula P15,000 to P60,000, depende sa kung anong klaseng scholarship kasali ang isang student.